A rocky path, an SUV and a GPS led us to Teluk Gong’s famous seafood institution, and it all began with a comforting clatter of crab shells. There was no empty table on the Sunday night, with some families choosing to sit in isolated huts scattered around the restaurant. Most others slouched on plastic chairs, slurping crab from its shell with one hand, a bottle of toddy (coconut rice wine) in the other. 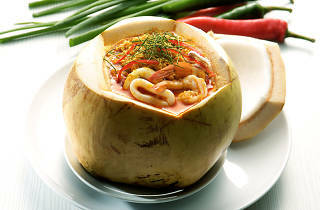 The signature coconut tom yam soup – simply tom yam soup scooped into the depths of young coconuts – is seen on most tables. 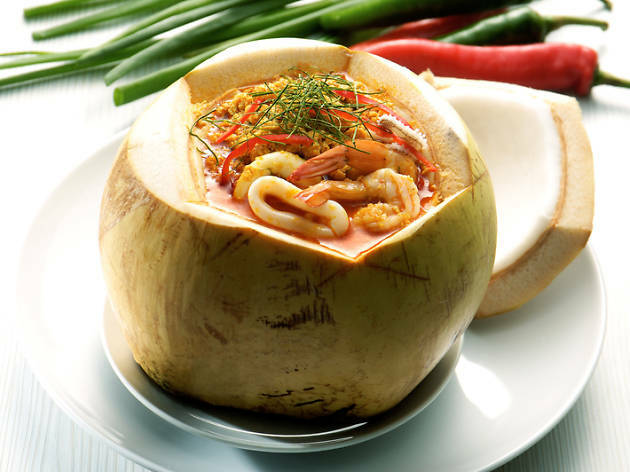 A pile of prawns, squid and vegetables outdo the volume of soup, and when eaten together, the result is sour-spicy from the tom yam, but also sweet from the remnants of coconut water. Once you’ve reached the bottom of the coconut, make sure to scrape the soft coconut flesh that takes a red tinge from the soup. To kickstart the hands-only seafood binge in orderly fashion, the kam heong lala was first in line. Each tiny morsel was packed with syrupiness, and for a while, the kam heong gravy didn’t matter. The shells were only lightly coated in the fragrant curry leaf mix, so expect sweet ocean flavours to hit the palate first. Once we descended from la-la land, we licked our fingers clean and pounced on a platter of butter prawns. We didn’t have to worry about the buttery santan taking from the prawn’s flavour, as once again, restraint was carefully practised on the part of the cook to preserve the natural juiciness of each tail. The crowning jewel of the night was the steamed whole red snapper, ordered in assam style following our waiter’s recommendation. A first sip of the gravy cradling the agape fish told us that the cook understands balance. Chili, tamarind and loads of blue ginger took equal chunks of the prize, and the result was a strikingly punchy gravy to pair with soft chunks of fish. The fish itself – unluckily caught from an aquarium in the kitchen just minutes after our order – was not giant in size, but moist and fresh, telling of a morning catch-totable system. At Coconut Flower, don’t shy from spice if natural seafood freshness is what you’re after; they have a way with incorporating the two just fine. To tame the stomach, (legit) toddy sold in 1.5-litre plastic bottles might not help, but adds to the experience here. We even noticed some mixing stout into their toddy. If our imagination allows for truth, stouttoddy and spicy seafood lead to the kind of legendary disaster you’d only envision in Klang.